In the Cambridge Historical Society collection at the Cambridge Museum, there is a round disc about 5 cm in diameter. 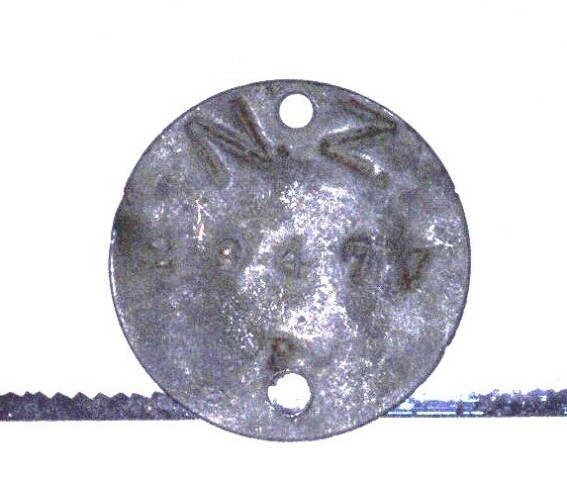 It has a hole at the top and a number 29477 and the letters NZ and P.
It was donated to the Museum along with other buttons and badges sewn onto a fabric belt that has ‘Gloire aux Allies’ sewn into it. After some research it has been found that this disc belonged to one of our Cambridge soldiers who died in World War One. John Preston was born 27 June 1891 to parents William and Nancy Preston. John was a farmer at Horahora when he enlisted in the New Zealand Rifle Brigade on 27 June 1916. He was Killed in Action 7 June 1917 and is listed on the Messines Ridge Memorial in France. The P stands for Presbyterian.